So what happens when you're on the shortlist for the prestigious Carnegie Medal? Your paperback gets redesigned, and your name gets a LOT bigger on the cover. Man, the redesign is HORRIBLE, at least from an anti-confusion standpoint. 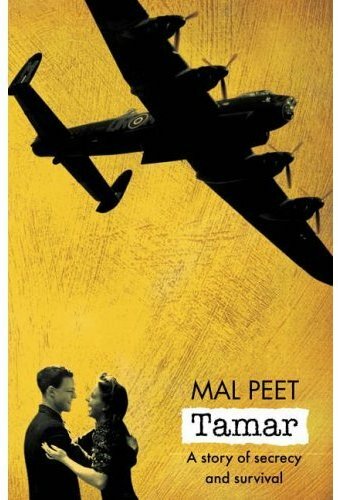 It made me think the book is written by Tamar and is named Mal Peet. The first was was a little better, but I would still have some confusion there. 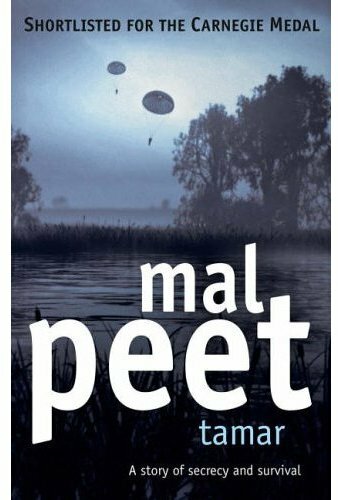 In fairness, it appears as though the redesign is driven in part by a desire to brand "Mal Peet" books under the same design, as is frequently done for other authors. The redesign is a good example how a moderatly adequate cover (the parachutes are somewhat goofy) can be ruined by type. Agree with Martin. The type seems wrong for the cover. Doesn't feel serious enough somehow. The original cover was much, much better. The redesign type is way too huge. Sure, capitalize on the medal nomination, but don't smack readers upside the head. Btw, Katharine, that's how I spell my name, too! I really like the original. The text isn't leaving a huge impression, but I love the colour and texture of the background, and the way it plays off the vintage, B&W images. I'm pretty indifferent about the redesign. The text is pretty uninspired and it totally overwhelms the rest of the design, which isn't unattractive, but lacks the charm and character of the original. I read this back when it had the original cover, which was in fact pretty horrible in the flesh - the used-nappy tan was particularly offensive. It's a terrific book, by the way. I think the redesign's better although Peet's name is frickin' huge.